We aren't #1... You Are! Our services are designed to maintain the look and value of your vehicle. If you are not completely satisfied, it's FREE! The Detail was top of the line. I pointed out dog hair and they were able to take it out with a neat technique – I will be back and refer people to come. I absolutely love this place. Amazing staff and quick service. They never make you feel dumb for asking questions either. I won't go anywhere else. Good job cleaning and fair prices. I only did the exterior this time but the gentleman at the end was careful to hand dry any spots the blowers missed which is a nice touch. I have the VIP service here at Water Works.. These guys and girls are the best.. They take their time, always checking after each other, working together as a team and am usually out of there in about 20 minutes. My car needed a wash bad and I googled for the nearest car wash to me. I went and was so thankful for the great experience. I arrived and within minutes had an attendant come out to help me. Very prompt and drove away very happy with my whole experience from beginning to end. THANK YOU!!!!! Water Works does a great job cleaning my car and making it look like it came out of a dealership! Great place for a car wash! All exceeded my expectations – they are my new go to car wash. The detail tech did a great job and went above and beyond a basic job. She was friendly and provided services I asked for. Great car wash facility. They always take care of my car and make sure that I’m happy with my car before I leave the facility. Incredible customer service- car was in terrible shape but the staff did a great job. Your team is great, cashier to those doing the windows and drying. I felt like the whole crew at this facility was courteous and helpful – I will come back. This visit was the best wash ever, used Montebello for 24 years. This is the location to visit. They pre-washed my SUV before sending it through because it was really dirty. They also do a really good job of drying it off. 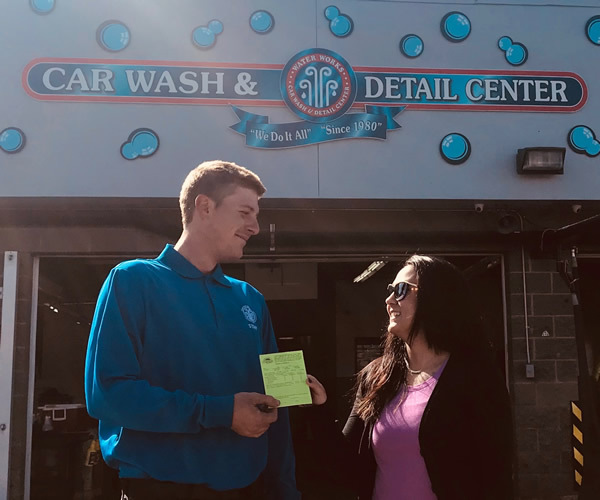 We’ve been told constantly that Water Works is the number one full-service car wash in Colorado Springs. Sure, we’re proud of this, and it’s a ranking we work hard to maintain, but we know it tells only part of the story. The larger part of the story is you. We exist to serve you, our customers, to meet your needs and to find new ways to improve your automotive experience. Without you we wouldn’t just go broke, we would lose our very purpose. We’re here to meet your needs, to prepare to meet needs you don’t yet know you have, and to continually find new ways to improve your automotive experience. Vehicles will be washed in 30 minutes or the wash is free. If a customer is not completely satisfied with any service the service is free. Our excellent team of employees make the difference. They are our most important resource, always have been, always will be. If it rains or snows within 72 hours we’ll re-wash it for free. In the winter, all locations close at dark.